The Mieco Beach Yacht Club is 13 years young. 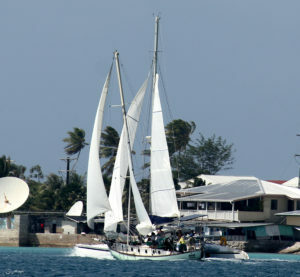 It was created to provide an entertainment center for cruisers and to attract more yachts to the Marshall Islands. If you’re headed our way, check in with the Yokwe (hello) Net on HF frequency 6.224 at 7:45am local time each day. The hailing VHF frequency is 71. The WebMaster is creating an archive of photos of boats and people past and present. If you have a photo with caption you would like to share, please send to miecobeachyachtclub@gmail.com. Please include the wording you would like for the photo credit.